One reason we don’t yet have robot personal assistants buzzing around doing our chores is because making them is hard. Assembling robots by hand is time-consuming, while automation — robots building other robots — is not yet fine-tuned enough to make robots that can do complex tasks. But if humans and robots can’t do the trick, what about 3-D printers? In a new paper, researchers at MIT’s Computer Science and Artificial Intelligence Laboratory (CSAIL) present the first-ever technique for 3-D printing robots that involves printing solid and liquid materials at the same time. 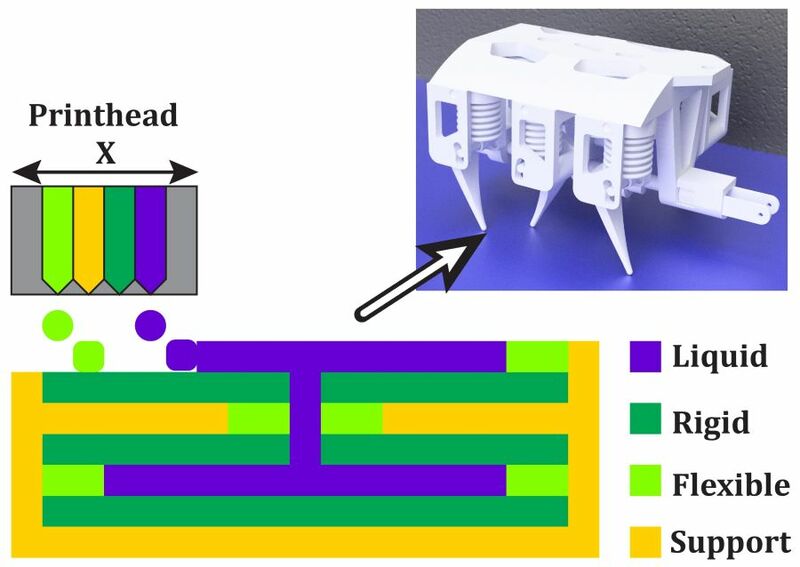 The new method allows the team to automatically 3-D print dynamic robots in a single step, with no assembly required, using a commercially-available 3-D printer. To demonstrate the concept, researchers 3-D printed a tiny six-legged robot that can crawl via 12 hydraulic pumps embedded within its body. They also 3-D printed robotic parts that can be used on existing platforms, such as a soft rubber hand for the Baxter research robot. The paper, which was recently accepted to this summer’s IEEE International Conference on Robotics and Automation (ICRA), was co-written by MIT postdoc Robert MacCurdy and PhD candidate Robert Katzschmann, as well as Harvard University undergraduate Youbin Kim. For all of the progress in 3-D printing, liquids continue to be a big hurdle. Printing liquids is a messy process, which means that most approaches require an additional post-printing step such as melting it away or having a human manually scrape it clean. That step makes it hard for liquid-based methods to be employed for factory-scale manufacturing. The team’s method of printing solid and liquid materials simultaneously allows them to create robotic structures that can be hydraulically powered. Another challenge with 3-D printing liquids is that they often interfere with the droplets that are supposed to solidify. To handle that issue, the team printed dozens of test geometries with different orientations to determine the proper resolutions for printing solids and liquids together. While it’s a painstaking process, MacCurdy says that printing both liquids and solids is even more difficult with other 3-D printing methods, such as fused-deposition modeling and laser-sintering. 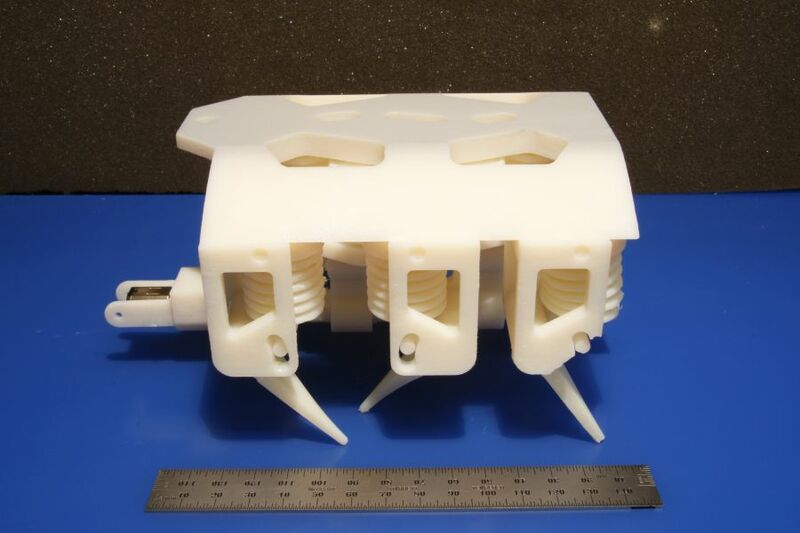 To demonstrate their method, researchers 3-D printed a small hexapod robot that weighs about 1.5 pounds and is less than 6 inches long. To move, a single DC motor spins a crankshaft that pumps fluid to the robot’s legs. Aside from its motor and power supply, every component is printed in a single step with no assembly required. Lastly, the team 3-D printed a silicone-rubber robotic hand with fluid-actuated fingers. 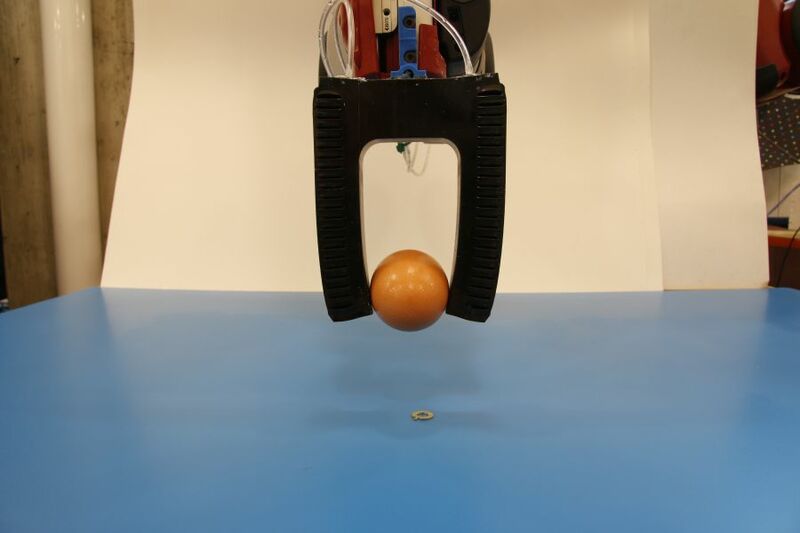 This “soft gripper” was developed for Baxter, a robot that was designed by former CSAIL director Rodney Brooks as part of his spinoff company Rethink Robotics. Compatible with any multimaterial 3-D inkjet printer, “printable hydraulics” allows for a customizable design template that can create robots of different sizes, shapes and functions. MacCurdy envisions many potential applications, including disaster relief in dangerous environments. Many nuclear sites, for example, need to be remediated to reduce their radiation levels. Unfortunately, the sites are not only lethal to humans, but radioactive enough to destroy conventional electronics. “Printable robots like these can be quickly, cheaply fabricated, with fewer electronic components than traditional robots,” MacCurdy says. The team is eager to further build on their work. While the hexapod’s 22-hour print-time is relatively short for its complexity, researchers say that future hardware advances would improve the speed. This isn’t Rus’ group’s first foray into 3-D printed robots. This past fall her team developed a similar gripper, while in 2014 they created an arm that can snake through a pipe and grasp an object. But where these projects still required multiple non-3-D printed objects, “printable hydraulics” gets even closer to printing all components in one step. The team’s work was funded, in part, by a grant from the National Science Foundation.